Do you have a little one who loves to move when they hear music? Maybe they’re always hopping around your living room, or wiggling in their car seat to the tunes on the radio. If you said “yes,” then consider this class for your terrific two-year-old! 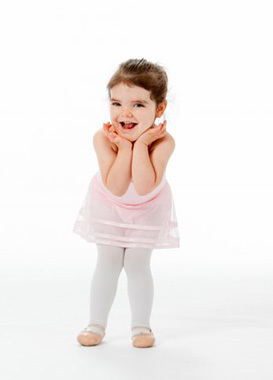 Designed for our youngest dancers, our Terrific Twos class is a great introduction to dance for your child as they explore movement through music. This class emphasizes creative dance exploration and basic understanding of musicality. It’s also a great way to help improve your child’s motor skills and coordination. Dancers in this class will work on gross motor skills as well as learning the beginning stages of movement with rhythm (like clapping and marching). Our Terrific Twos program also promotes the development of social skills at an important age. This class is a great way for your two-year-old to meet new friends, and take direction from someone other than their parent or guardian. This class will also perform in our annual recital, giving your little one a taste of the excitement and fun of putting on a dance production.